Despite its sophisticated appearance and advanced features, the *istDS is designed to be smaller, lighter and more maneuverable than the popular *istD. Made of a non-slip material, the *istDS’s large grip is configured to provide a firm, comfortable grip when carrying and shooting. • High-rigidity stainless-steel chassis, contributing to a reduction in size and weight. • Multiple-source power supply, offering compatibility with AA-size batteries for easy battery replacement even on the road. The *istDS features a large 2.0-inch LCD monitor with approximately 210,000 pixels, along with a brightness control function, to make image viewing much easier during shooting and playback. Its large data panel on the top panel also facilitates camera operation by displaying important data with large, easy-to-read letters and icons. In addition to the menu screen, the LCD monitor provides visual guidance to explain exposure modes and operational procedures, making it simple and effortless for anyone to enjoy high-quality digital SLR photography right from the start. Viewfinder performance is very important in determining image composition and improving the response to shutter opportunities. 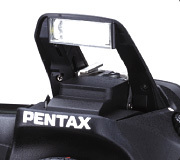 The *istDS incorporates a PENTAX-developed glass pentaprism, designed exclusively for its digital SLRs. Offering an impressive 95% field of view at 0.95X magnification, its viewfinder assures outstanding accuracy and versatility in composition and picture framing — comparable to those incorporated in 35mm-format SLRs. • Large, accessible control buttons, dials and switches, equipped with easy-to-recognize indications. Just point the camera at your subject and press the shutter release button slightly, and the *istDS automatically and instantly selects one of the five distinctive exposure modes (Standard, Portrait, Landscape, Macro and Action). Each mode is programmed to optimize exposure, focus, white balance, sharpness, contrast, and color saturation for a given subject, letting you to capture beautiful pictures frame after frame with minimal effort. In addition to the fully automatic Auto Picture Program, the *istDS offers a host of creative exposure modes to optimize your visual expressions — from six user-friendly Picture Modes to conventional Aperture-Priority AE, Shutter-Priority AE and Metered Manual modes that offer greater flexibility over exposure settings. 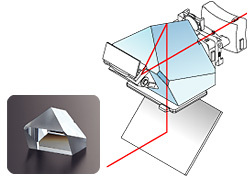 Built into the *istDS’s pentaprism housing, the functional auto flash pops up automatically with a slight push on the shutter-release button when the camera detects low-lighting or back-lighting conditions. • Reliable 16-segment multi-pattern metering, with user-selectable options of center-weighted metering and spot metering. • Convenient shooting functions, including consecutive advance, auto bracketing and remote control. 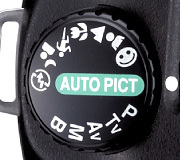 • Electronic depth-of-field preview, with a preview lever positioned around the shutter release button for easy fingertip control. 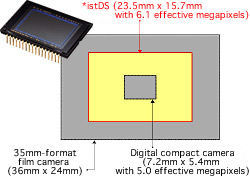 The *istDS features a large CCD image sensor (23.5mm x 15.7mm) with an impressive 6.1 effective megapixels — considerably larger than those incorporated in digital compact cameras. Since each pixel is larger and capable of receiving a greater amount of light — that is, information — than smaller counterparts, this sensor produces sharp, high-definition images rich in gradation and contrast, with minimal noise. The *istDS incorporates a newly developed, more sophisticated imaging engine for more faithful reproduction of recorded images. It offers higher performance in noise reduction and color/gradation reproduction than conventional engines, assuring top-grade image quality available only with first-rate digital SLRs. You can adjust the sharpness, contrast and saturation at five levels for more minute control over the different types of subject or diversified photographic conditions. The *istDS lets you choose the final image appearance between the true-to-life Natural and the more lively Bright. The *istDS offers four digital filers (black-and-white, sepia, soft and slim) to create eye-catching visual effects on recorded images. The soft filter, in particular, produces a soft-focus effect equivalent in quality to a high-performance soft-focus lens. 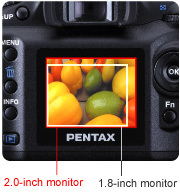 • Pinpoint white balance control, with an option of manual adjustment. • Histogram display during image playback, with an overexposure indicator. • User-programmable custom functions to personalize camera operation. 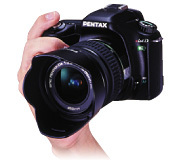 In addition to conventional printing and sorting functions, the upgraded PENTAX PHOTO Browser software (included on the accompanying CD-ROM) offers more useful features than ever before. The PENTAX PHOTO Laboratory image processing software has also been upgraded for greater convenience, with additional functions such as preview screen zooming and high-speed processing. • Direct printing with PictBridge-compatible printers to eliminate the need for a PC. • USB interface with a PC for effortless data transfer.